Smart specialisation can help your region participate in today's highly competitive global environment by taking advantage of your distinctive industrial and innovation strengths. Smart specialisation aims to promote more strategic approaches to regional innovation and economic growth by concentrating resources on those activities that are likely to effectively transform the existing economic structures through R&D and innovation. This approach calls for strategies that identify a limited number of priorities based on the recognition of the region's distinctive industry structures and knowledge bases. It also emphasises the need to ensure that activities are fully integrated in local value chains and promotes the use of enabling technologies that can transfer and add value between related sectors. However, recent assessments have revealed that the effectiveness of regional innovation strategies have been hindered by selection of priorities that are too generic or that do not appropriately take into consideration the local context. Regions struggle to clearly identify and articulate what makes them really distinctive and often resort to replicating the priorities selected by others, without necessarily having the capabilities to support them. 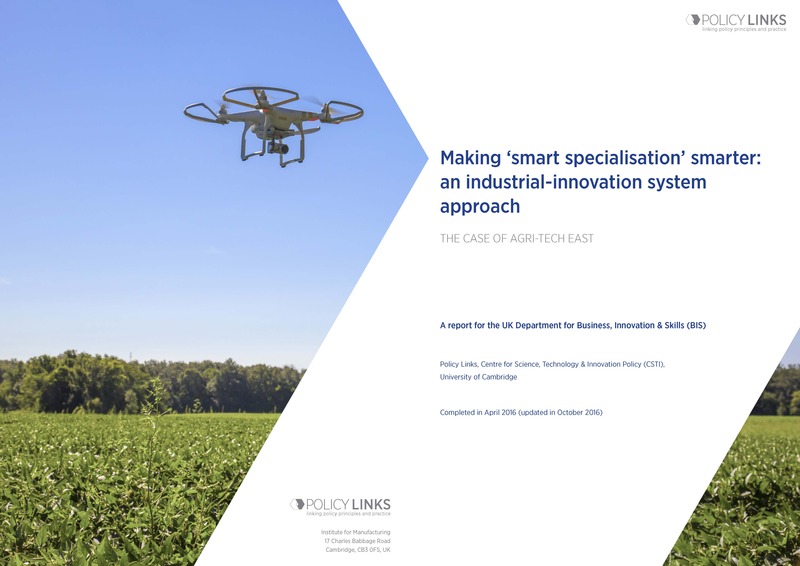 To address these issues, the IfM’s Policy Links team and researchers from the Centre for Science, Technology and Innovation Policy have designed a new approach to smart specialisation in collaboration with the UK Department for Business, Energy and Industrial Strategy (BEIS). This novel approach is grounded on the recognition of the structure and dynamics of modern industries and technologies. It provides a simple yet highly structured approach with the potential to guide not only more systematic statistical analyses but also more effective engagements of the local industrial and innovation communities. identify promising opportunities for specialisation and future value capture which the region is particularly well placed to pursue. For a full report of the project carried out in the East of England, please click here. To find out more about smart specialisation and to discuss the ways in which you can implement it in your own region, please contact the Policy Links team.